the Newly Restored Le vent de la nuit (Night Wind), and more! Metrograph’s Philippe Garrel retrospective, the most complete ever undertaken in North America, continues in November, on the mission described by Nicholas Elliott when discussing the first part of the retro in 4Columns, to “finally establish [Garrel] here as the towering post-New Wave filmmaker that he is recognized as in France.” Part 2 includes a mid-70s masterwork of stark poetry (Un Ange passe), major works from the 1990’s starring major figures of French cinema, including Catherine Deneuve and Jean-Pierre Leaud, three recent works starring son Louis, and a special engagement of the modern-classicRegular Lovers. Many of the familiar faces in the Garrel universe—father Maurice, Laurent Terzieff, Bulle Ogier, and Nico in a stunning live performance sequence, framed by the dark of the night sky. A bridge between the silentLes Hautes Solitudes and the narrative L'enfant secret, this is one of the most singular works of a singular career. A tender salute to the generation of French filmmakers, the Post-New Wave, the generation which happens to be Garrel’s own. Featured figures include Jacques Doillon, Chantal Akerman, Juliet Berto, and Léos Carax, though the central figure is the absent Jean Eustache, who had taken his own life in 1981. 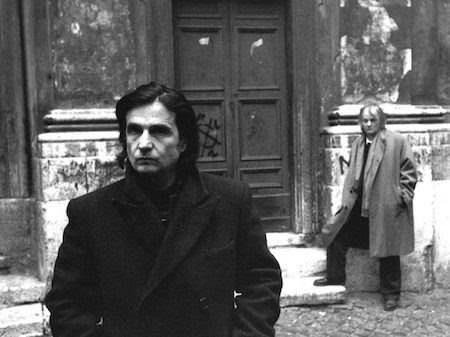 With Rue Fontaine, Garrel’s contribution to the omnibus film Paris vu par… 20 ans après, and Philippe Garrel, Artiste - an interview with the filmmaker. Jean-Pierre Léaud and Lou Castel (both of whom made their acting auspicious debuts in the equally auspicious directing debuts of François Truffaut and Marco Bellocchio, here are found trying to shake off the doldrums of middle-age and romantic confusion by getting out of Paris together. Gorgeously photographed by the legendary Raoul Coutard in black and white, this self-analytic study in arrested adolescence plays out against the backdrop of the ongoing Gulf War, which brings with it the additional sting of political disappointment. Original score by John Cale. 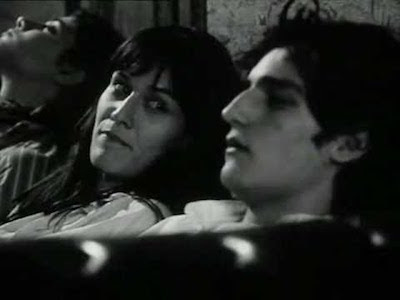 A variation on the figure of the romantic triangle, one which endlessly fascinates Garrel, Le Coeur fantômestars Rego as a painter who begins a new relationship with a university student after leaving his unfaithful wife, only to find himself gutted with guilt over leaving his two children behind. Richly textured, and evidence of Garrel’s unusual, little-commented-on gift for directing children. “Unjustly overlooked” - Kent Jones. A meeting between two elemental forces of the French cinema, Garrel and Catherine Deneuve, Le vent de la nuit looks back to Garrel’s stern, cold productions of the 1970s, depicting a world where suicide is the only escape from the incessant demands of the past. With Deneuve as an unhappy housewife, Xavier Beauvois her young lover, and a lovely score courtesy of John Cale. A marvel of sustained rhythm and tone. New Digital Restoration, overseen by cinematographer Caroline Champantier. In his most recent film Garrel returns to the subject that fascinates him above all others: The dynamics of coupledom, and the deceptions and omissions that intimacy breeds. Stanislas Merhar and Clotilde Courau are a fortysomething pair working together as filmmakers, each unfaithful to the other. Co-written with wife Caroline Deruas and legendary Buñuel collaborator Jean-Claude Carrière, this exquisite miniature offers an acute study in imprisoning intimacy and masculine pig-headedness. May ’68—and after–the moment of collective uprising, the comedown of returning to a world fundamentally unchanged—is an event absolutely central to Philippe Garrel’s worldview. After decades of distortion and misinformation on both the French right and left, to further agendas and re-write history, Garrel felt compelled to portray the period as it was by someone who was there, and correct the historical record for future generations. François is our guide (played by Garrel's son Louis), a young poet who goes from the exhilaration of the barricades to the exhaustion of drug addiction and aimlessness. Shot in 1:33Academy ratio (full-frame) black-and-white that makes the 1960s seem near to the 19th century, the film combines youthful romance with adult rue, and introduced Garrel anew to the United States. A vintage 35mm print of Regular Lovers screens with Actua 1, his thought-to-be-lost short film shot by a twenty year old Garrel, in May ‘ 68. A Film Desk release.